In my last post I discussed the large cash reserves that companies have been holding since the 2007 recession. As I mentioned there are several reasons for this, some of it has to do with lack of R&D investment. R&D is an expensive investment. This requires both train scientists and equipment to conduct the research. In addition there are extra requirements for technicians and other employees to support the R&D effort. This isn’t cheap. 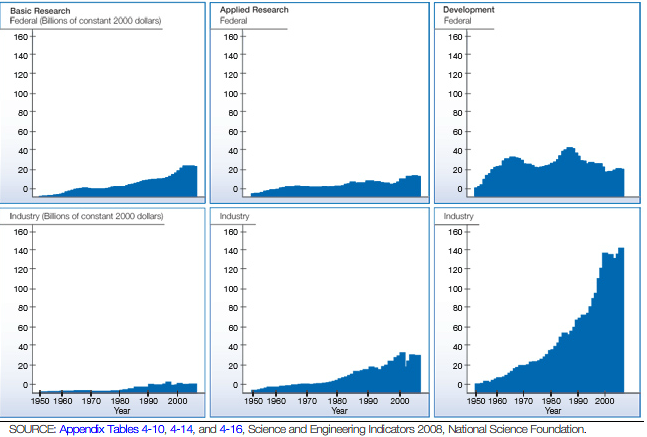 As we can see in the bottom half of the chart all types of research funding has decreased recently. R&D is not a certain thing by any stretch of the imagination. This is why companies are paring with universities to share the burden of R&D. Universities are doing much of the basic and applied research, while industry is developing it into product. This is where the money is and the greatest amount of certainty. You can’t really blame companies for this, but they need to work to develop their own technologies regardless of the work being performed at universities. To compensate many companies do engage in corporate venturing. This is where they fund a start up to conduct research and get a product to a certain position and possibly buy that company after a certain maturity point, set up an exclusive license or license the technology once it’s mature. This reduces the large company’s risk exposure. The final piece that has increased since the late 80’s has been the amount of litigation due to patent infringement. In 2011 the amount of money spent on patent litigation was $29 Billion. That is a lot of money. That’s a quarter of the money that Apple has in it’s reserves. We also know that Apple is one of the largest spenders on litigation. I know there are a lot of Apple lovers out there, but they could have invested that money into more products and reduced their risk of a flop with the next iPhone. We all know that iOS6 was a major disappointment for many people, spreading their revenue stream into more sources with some cool research could mitigate any fall out from that or if iOS7 is more of the same. Litigation is such an outsized risk because it can lead to your entire firm being shut down by a non-producing entity. This reduces the incentives for innovation and increases the incentives for hoarding cash. This entry was posted in Business, Economics, Innovation and tagged Apple, cash, Corporate Profits, Corporate Venturing, Innovation, litigation, patent, patent litigation, patent trolls, Patents, research, risk. Bookmark the permalink.